They say a picture is worth a thousand words, yet sometimes, the picture alone may not be enough. Often, we need to add a word, phrase or caption to an image to help convey a certain message. Or we may be designing a print or web layout and need text for headings, banners or buttons. And of course, sometimes we just want to create cool looking text effects. As a photo editor and graphic design tool, Photoshop is probably not the software you want to be using if your goal is to write the next great novel, or if you want to update your resumé (in case the writing thing doesn't work out). Yet it does have many of the same type features found in other programs like Illustrator and InDesign, making it more than capable of adding simple and stylish text to our images and designs. In this tutorial, we'll cover the basics and essentials of working with text in Photoshop! There's two main kinds of type that we can add in Photoshop - point type and area type. By far the most commonly used of the two is point type which is what we'll be looking at in this tutorial. In the next tutorial, we'll learn the difference between the two and how to add area type to our documents. The Type Tool's"I-beam" mouse cursor. Clicking the triangle to the right of the font selection box. Photoshop lists all the fonts that are installed on your computer. Photoshop (CS2 and higher) includes a preview of the font beside the name. We can change the size of the font preview by going to Photoshop's Preferences settings. On a PC, go up to the Edit menu in the Menu Bar along the top of the screen, choose Preferences, and then choose Type. On a Mac, go to the Photoshop menu, choose Preferences, then choose Type. This opens Photoshop's Preferences dialog box set to the Type options. The Font Preview Size option sets the size for the font preview in the Options Bar. The larger font previews are easier to see but take up more space than smaller previews. Clicking the triangle to the right of the font style selection box. Choose a style for the font from the list. Clicking the triangle to the right of the font size selection box. Photoshop makes it easy to choose from several preset font sizes. Type a size directly into the Size box if none of the preset sizes will do. Click on the color swatch to change the color of the text. 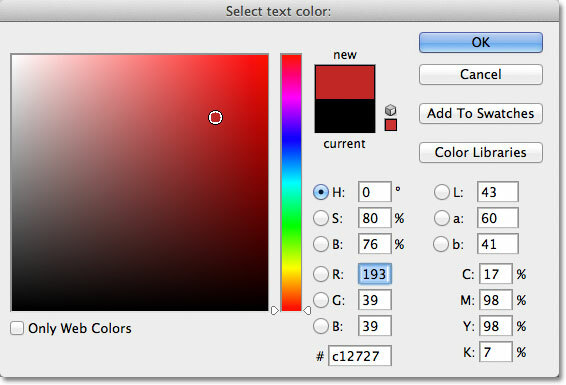 Use the Color Picker to choose a new color for the text. As I mentioned briefly at the beginning of the tutorial, there's two different types of, well, type, that we can add to a document in Photoshop. We can add point type (also known as character type), and we can add area type (also known as paragraph type). The difference between them is that point type is mainly used for adding small amounts of text to a document (a single letter or word, a heading, etc.) while area type is used for adding larger amounts of text inside a pre-selected area. The one we're looking at here is point type because it's the most straightforward of the two and the one you'll use most often. Text is placed on special Type layers in the Layers panel. Simply click in the document with the Type Tool, then add your type. Move your mouse cursor away from the text as you're typing to temporarily access the Move Tool, then click and drag the text into position. Click the checkmark in the Options Bar to accept the text. If you have a keyboard with a numeric keypad, you can also accept the text by pressing the Enter key on the numeric keypad (usually in the bottom right corner of the keypad). Or, if you don't have a numeric keypad on your keyboard, you can press Ctrl+Enter (Win) / Command+Return (Mac) to accept the text. Photoshop renames the Type layer using the first part of your text. Press Enter (Win) / Return (Mac) to add a line break and continue typing. Again, when you're done typing, accept the text either by clicking the checkmark in the Options Bar, by pressing the Enter key on a numeric keypad, or by pressing Ctrl+Enter (Win) / Command+Return (Mac). Type layers can be deleted by dragging them down on to the Trash Bin. Up next, we'll learn how to select and edit text after it's been added to the document! Some text that needs editing. An insertion marker appears between the letters "e" and "l". The first spelling mistake is corrected. If you click in the wrong spot and place your insertion marker between the wrong letters, use the left and right arrow keys on your keyboard to easily move the insertion marker left or right along the text as needed. Click and drag over individual letters to highlight them. The second spelling mistake is now corrected. Double-click to select an entire word. Double-click on the thumbnail for the Type layer to select all text on the layer at once. All the text on the Type layer is selected at once. Text that has already been added with the font, style and size that was initially chosen. To change the font, style or size, just select the Type layer itself. Change the font, style and / or size in the Options Bar. You can change the font, style and size at any time. With the Type Tool selected and the Type layer selected, click on the color swatch in the Options Bar. Choose a new color for the text from the Color Picker. The color of the text has been changed from black to red. Highlighting a word before selecting a new color. Only the highlighted word appears with the new color. And that's the basics of adding text to our documents in Photoshop! In this tutorial, we learned how to add short, simple text using point type. In the next tutorials, we'll learn how to add larger amounts of text inside a pre-selected area using area type, and we'll look at some additional type options that are available in Photoshop's Character panel and Paragraph panel!